We are looking at rewooding the rear wheels on our Canadian built 1909 Model T Ford.Are the spokes & fellows painted or varnished ? The second question is, are the clincher rims painted black ? The Canadian 1909's had 30 X 3 1/2 wheels on the front & rear.Right now the wheels have a natural finish on them. It seems half the T's you see now, or maybe more than half, are wearing wheels with a "natural" wood finish. Until 1913 wheels were red, green, gray, and blue at various times. After early 1913 they came from the factory painted black. Wood finish did not become an option until 1925 (for 1926 models?). I'll add the observation that styles in wood finish have changed drastically since Model T days. In the teens and before, oak was widely used in furniture but was generally painted. I recall that by the fifties that old oak furniture was considered very pass� and you could hardly give it away. Then in the sixties it became fashionable to strip the old furniture and give it a natural finish, and it became very desirable. That fashion continues today and in the Model T world you see it widely applied to wheels. It's now a matter of personal preference. I prefer my wood wheels black, the way God and Henry intended. I have just ordered a set for my 1910 Canadian and was wondering if the steel rim should be painted red (as per the car) or black to match the tyres. I was also thinking of machining my 6"hubs down to 5 1/2" as its impossible to get a full set of 5 1/2" What do you think Steve?? I don't have enough experience with the early cars to comment on the hubs. As for rim color, I'm pretty sure they would be body color. 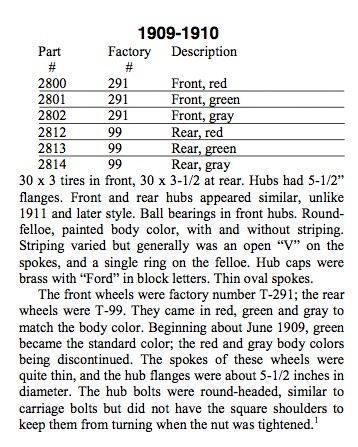 1910 cars typically didn't have black tires. I think, that except for a pin stripe, the entire wheel is body color in '09, '10, and '11, and maybe through '13. But I am not an expert in the earliest cars. Canadian cars are a bit different in some details, but in this I don't think they are. 2800 Front wheel 1909-1914...30"x 3�" rim blue. 2800� Front wheel 1909-1914 ...30� x 3" rim blue. 2812A Rear Wheel (specify colour) 1909-11... 30�x 3�� rim straight hub. 2814C Rear Wheel - blue (taper hub) 1912-1914... 30�x 3� �rim. Canada no different to the US in this regard.